Attachment of tooling to skinned sandwich structures for some applications requires the bolt head to be recessed into the structure. The normal custom and practice is to counter-bore the structure sufficiently deep to accept the bolt head either in line or below the structure surface. The counter-bore width is usually sufficient to accept the bolt head with clearance for a torque wrench. Counter-bore showing bolt head recessed. 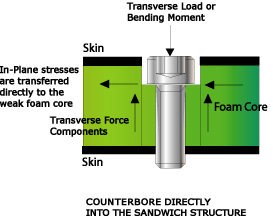 Counter boring through the sandwich structure skin results in in-plane stresses being reacted by the weak foam core. This counter-bore configuration is un-acceptable if the bolt carries any load. A insert will not resolve the un-acceptable stress state. 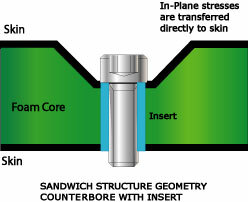 Counter-bores in Composite Sandwich Structures can be accommodated by means of sandwich structure geometry,and insert block geometry. All methods provide connectivity between top and bottom skins resulting in the skins transferring in-plane stresses. A recess for the bolt head can be molded into the Composite Sandwich Structure. The recess geometry substitutes for the counter-bore. The connectivity of the skins is preserved. An insert is shown to prevent foam compression. 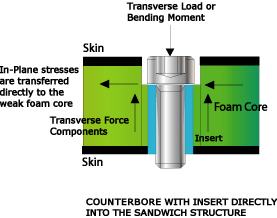 An INSERT BLOCK is molded within the composite sandwich structure. The counter-bore is machined in the structure after manufacture. The insert block preserves the connectivity between skins.